Enjoy camping like never before. 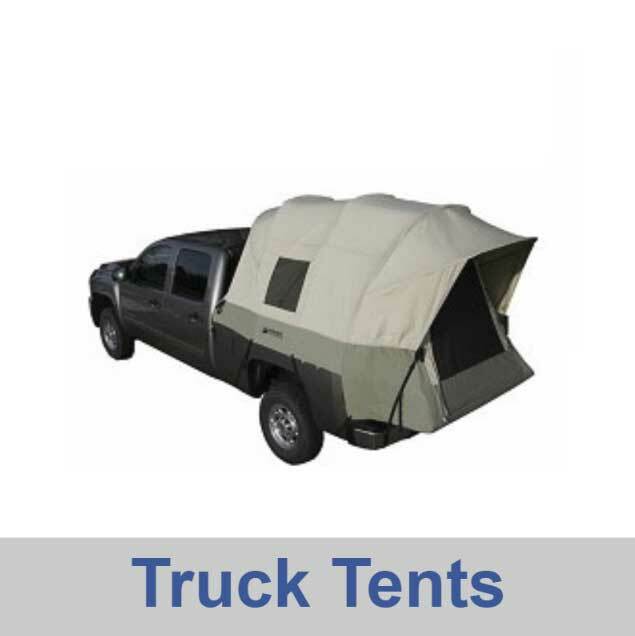 Kodiak tents and Teton cots, pads, and sleeping bags are built for camping in the woods, desert, freezing cold, outback, mountains, beaches, and anywhere you can enjoy nature without worrying about your gear. We offer expert customer service both before and after the purchase and include a limited lifetime warranty. The reviews speak for themselves. Cotton duck canvas is designed to keep you warm when it's cold, keep you cool when it's hot, and create family memories for generations. Be prepared to be blown away by the quality and rigidity. Click here to visit our Kodiak Canvas Videos Page where you can learn more about each tent, see them up-close and personal, set up and in use. Kodiak has a new patent-pending design you're going to want to see. It has its own built-in hood called the Z Top. 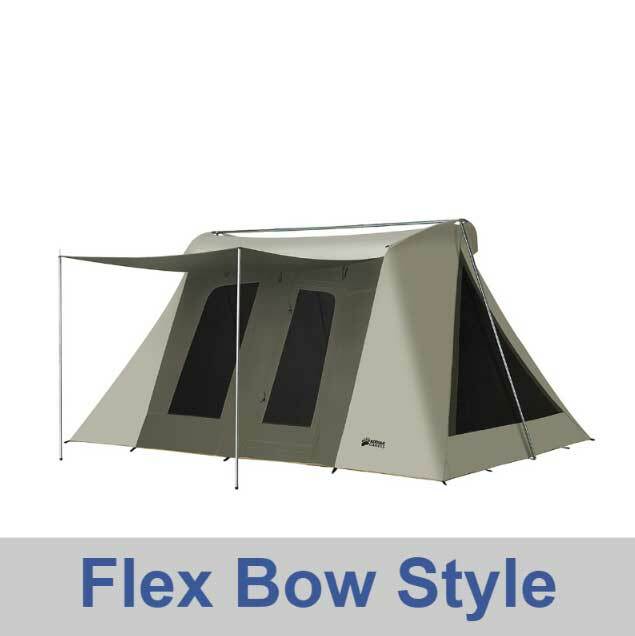 Superior to competitor canvas tents. Up in 5 minutes, Lifetime Warranty, Water Tight, PVC Floor, Steel Tent Poles and 12" Steel Stakes. 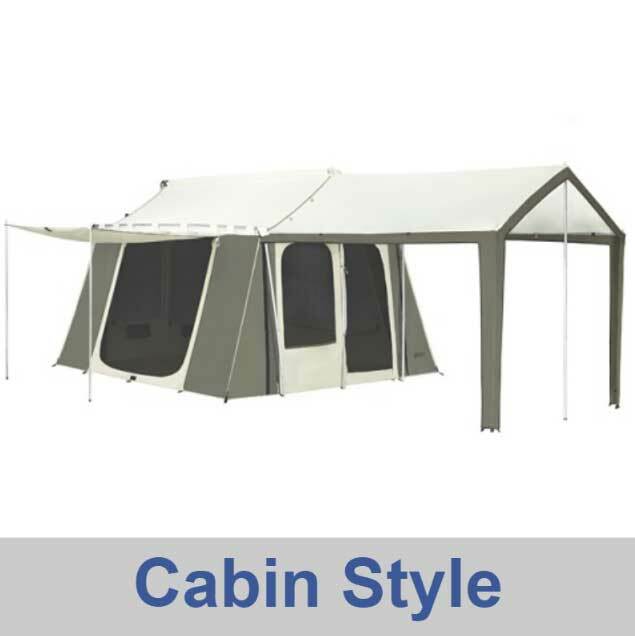 Cabin Tents at low prices and volume discounts. Shipping Discounts on 2 or more items. Large orders ship free at Competitive Edge Products. 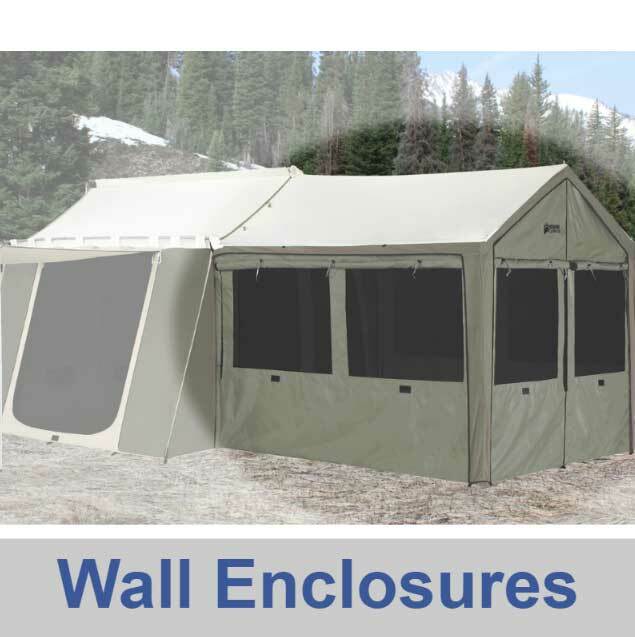 Awning Enclosures at low prices and volume discounts. Huge discounts when ordering with your tent. Kodiak Wing Vestibules provide privacy and a bit more security when in crowded campgrounds. Kodiak Canvas tents are perfect for festivals and jamborees across the United States. The most popular festival for these tents includes desert camping. Check out these tents for rugged dusty, windy, and hot camping. Keep the dust and water out while keeping temperatures at a minimum. 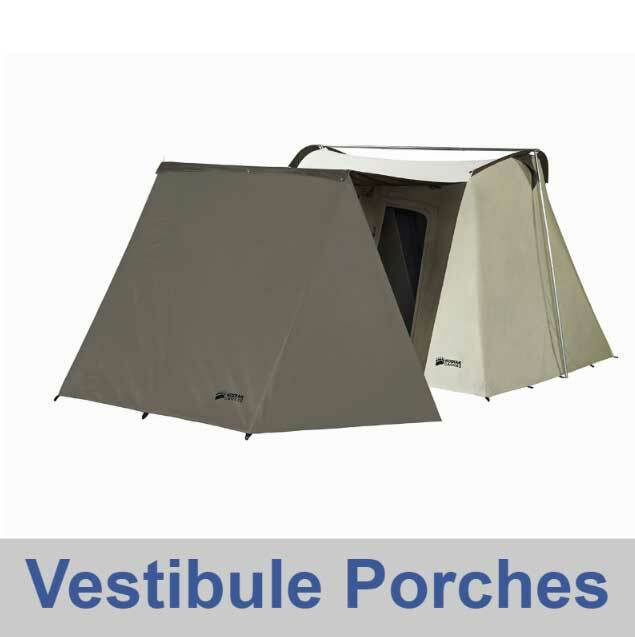 Kodiak Canvas Tents are excellent camping equipment for churches, families, scouting groups, and hunting expeditions. These high-quality tents feature a wick-free, yet breathable, heavy-cotton design. 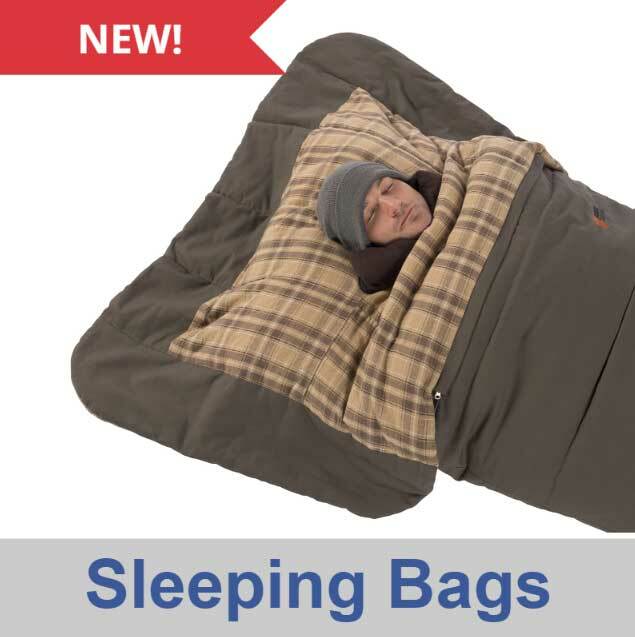 Suitable for regular camping trips to moderately harsh weather conditions. Most of our tents are even suitable for all four seasons. 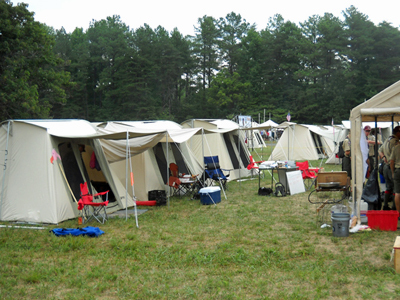 The cabin style tents also make a very good base camp for big and small game hunting groups. Kodiak camping gear comes in various sizes that can typically sleep 4-8 adults comfortably. Kodiak also warranties all of their tents with a limited lifetime warranty. Meaning, if something goes wrong we've got you covered. See warranty page for more details. Kodiak Canvas tents have a hydro-shield protective covering to help avoid water leaks. The canvas is thick to help protect against the elements and moderately extreme outdoor temperatures. Recent redesigns in the structure have moved away from aluminum poles to steel poles providing a better structural strength and longer life for the tent. Canvas, as a cotton-based material, needs to be kept dry in storage when not in use. Typically, wiping down the tent with a dry towel before storage is sufficient. The tent is pre-treated with an extensive waterproofing process across the entire tent - seams and all. 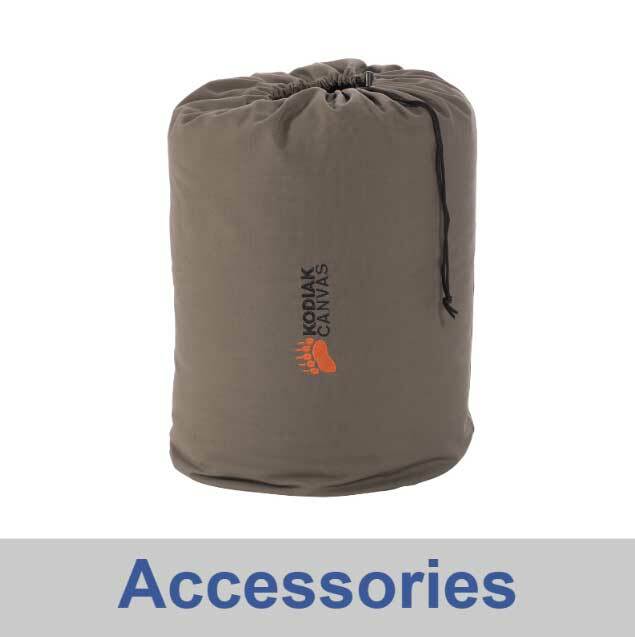 Kodiak Canvas Tents are made with an exceptional, marine-grade, 100 % cotton duck, Hydra-ShieldTM canvas. Just what is Hydra-Shield Canvas? 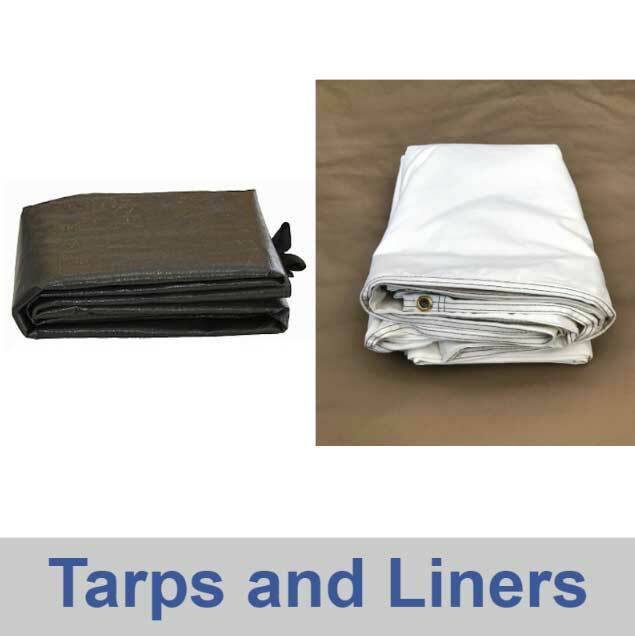 It is a custom-made woven and addressed canvas ideal for the function of high quality tent making. 1) You will certainly stay dry even in a torrential rainstorm! It's fine to touch the ceiling and inside walls as it rains. This canvas does not leak or wick water into the tent. 2) Unlike synthetic materials, or canvas with a paraffin or oil-based treatment, our canvas is breathable! This enables water vapor to escape, minimizing condensation, mugginess, and moisture. Simply put, you are dry and comfy. 3) Unlike canvas with paraffin or oil-based procedures you will not need to retreat the canvas. Hydra-Shield's silicone-based manufacturing methods is durable and exceptionally resilient. 4) The canvas is solid and long lasting. It will hold up to the elements and long outlive tents made with substandard textiles such as nylon. Kodiak Canvas camping tents are made with a remarkable, marine-grade, 100 % cotton duck, Hydra-ShieldTM canvas. It is a custom woven and treated canvas suitable for extreme outdoor camping. 2) Unlike synthetic textiles, or canvas with a paraffin or oil-based treatment, our canvas is breathable!